Dr. Abdulrahman Jawahery, Chairman, IFA. 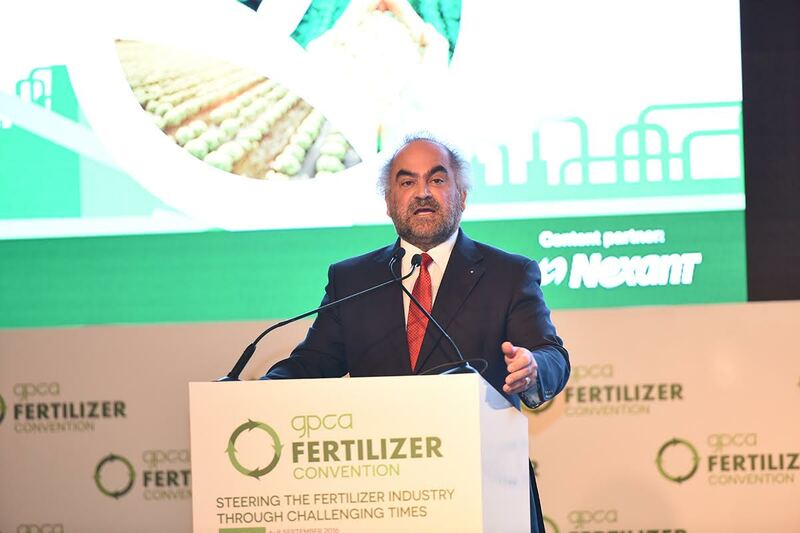 Dubai, United Arab Emirates: With the global fertilizer sector expected to grow at a relative flat rate till 2020, the industry can anticipate a period of change in the medium term, according to speakers at the 7th GPCA Fertilizer Convention in Dubai. Hosted by the Gulf Petrochemicals and Chemicals Association (GPCA), the annual conference gathered industry experts over a 3-day event. Global fertilizer demand is expected to grow to 200 million tons by 2020, expanding by 1.3% year on year, according to forecasts by the International Fertilizer Industry Association (IFA). The GCC, meanwhile, holds a fertilizer portfolio of 37.7 million tons today, a capacity that is one-fourth of the region’s total petrochemicals production capability, as per the GPCA. For GCC producers, further challenges appear in the form of changing behaviors of key consumers and evolving market conditions. However, there are opportunities on the horizon. A future opportunity, said another expert, lies in solutions rather than products. The agility of Chinese producers has a huge implication for GCC fertilizer companies.